When Carlos Casteneda meets the mystic and teacher Don Juan, one of his first assignments is to intuitively pick where to sit in an empty room, the master explaining to the perpetually befuddled Casteneda that you must develop your intuitive powers in order to develop as a magician. The same is true of us magician chefs. We taste a dish, our intuitive powers ask, “Hmmm, what’s it need. Hmmm. Cinnamon.” “Cinnamon?! In chili?,” the rational mind may reply. “Yeah, and maybe some raisins too.” You go with it and it is sublime. I suggest having your spices out where you can see them. I’m still surprised at how many of my top cooking friends have their spices in bottles and baggies in a box stuck in the cupboard, where they have to tediously sort and poke to find what they want. I’m somebody who likes to see the useful items in my life—if something is hidden away, I’m likely to neglect it, deem it too much trouble, forget about it for years. My mother alphabetized her spices—that’s one way. I group mine by affinity. The Mexican spices (cumin, coriander), segue into the Indian spices (cardamom, turmeric), the Italian (dill, basil). It is not entirely methodical, but instead organized by what feels right. Don’t know where paprika would fall, but it’s reddish and complex, so I put it up by the Indian spices. 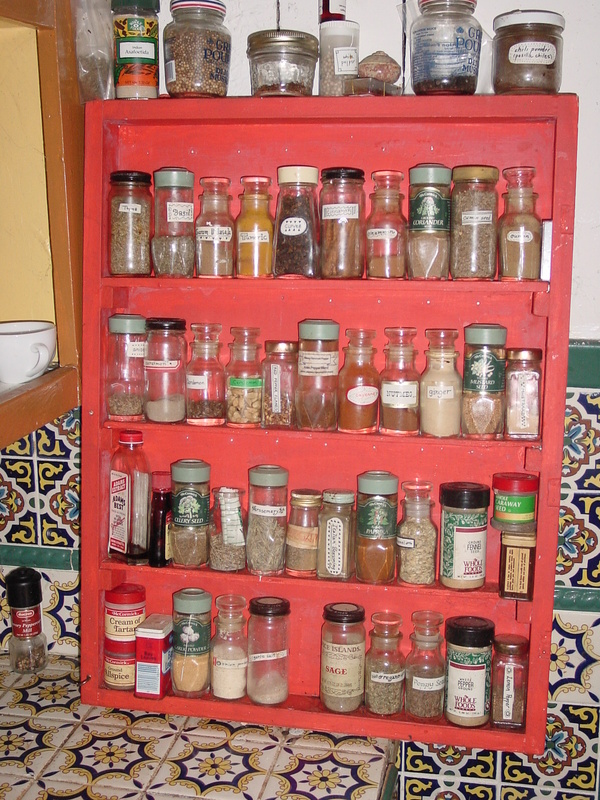 Here’s what I have in my spice rack: paprika, tumeric, garam Masala, curry, nutmeg, cloves, ginger, cumin (ground & seed), coriander (ground & seed), fennel (ground & whole), anise, cardamom (in pods, shelled, and ground), red pepper flakes (get these free from pizza delivery packets), cayenne, cinnamon (ground & sticks), cloves (ground & whole), mustard (ground & yellow & black seeds), basil, dill, rosemary, Italian seasoning, marjoram, whole dill seed, caraway seeds, onion powder, bay leaves, sage, thyme, oregano, lemon pepper, white pepper (ground & peppercorns), celery seed, garlic powder, homemade chili powder, pepper (ground & peppercorns), asafetida, Mrs. Dash, fenugreek, cream of tartar. I mostly use all of these. Then have some even more obscure ones tucked away just in case some fool recipe comes up with something from left field (and I came upon a spice sale one day and stocked up). I love salt and pepper–I really get how they’ve been dubbed the king & queen of American spices. There used to be a diner in the blue-collar town of Lee, Massachusetts, that only served soup and was called The Salt & Pepper. I thought that was the greatest name. I didn’t grow up loving salt, and I had a slightly snobby scorn for those who salted their food with gusto. But then I started using sea salt and everything changed. I started to crave salt in my food in what felt like a good craving, a what-my-body-really-needs-to-be-healthy craving. (How do you tell the difference between a hale-and-hearty craving and demon garden-path, addictive, running-from-your-emotions craving? Intuition, bien sur!) Now I love salt, and add it often, and it all seems to the good. (And my blood pressure is still on the low side, as before.) If you want some info on the difference between typical table salt and sea salt, here’s a link (Salt: What You Don’t Know Can Harm You – and What You Should Do Instead). About pepper, I used to grind up a batch of peppercorns in my coffee grinder (more on this, anon), and then keep it handy for the next months. (I guess it’s better to have it absolutely fresh ground, but I couldn’t tell the difference enough to bother.) But recently, my gourmet good-cooking friend Hannah introduced me to coarse ground pepper. You buy it in a large bottle at your local grocery (regular grocery, not high end), and it’s more coarsely ground than what will come out of your pepper mill. You have to like biting into a big wake-me-up chunk of pepper, but it so happens, I do. I keep my salt and pepper on the ledge right above my stove in little open dishes—beautiful creamy porcelain—so it’s easy to pinch a little here & there. For me, a big part of aiding intuition is having everything easy and appealing. Grinding spices fresh is a great way to really make them sing. Peppercorns, cinnamon, coriander seeds (yum! ), cumin seeds, mustard seeds, cardamom, etc. You can have a designated spice grinder, sure (and actually, I’m in the market for one). But don’t be scared to use your coffee grinder. I wipe it out first, but not real carefully. (You may be getting the gist of how I cook here.) A little coffee flavor with the pepper may be a good thing. And then, after I’ve ground up my spices and I’m ready to grind coffee again, I rarely clean it out. I’m curious about how different spices may taste in the coffee. That’s how I discovered my current “I can’t wait to go to bed, so I can wake up and have it” coffee. I was making a fresh batch of chili powder and left some in the coffee grinder. Of course. 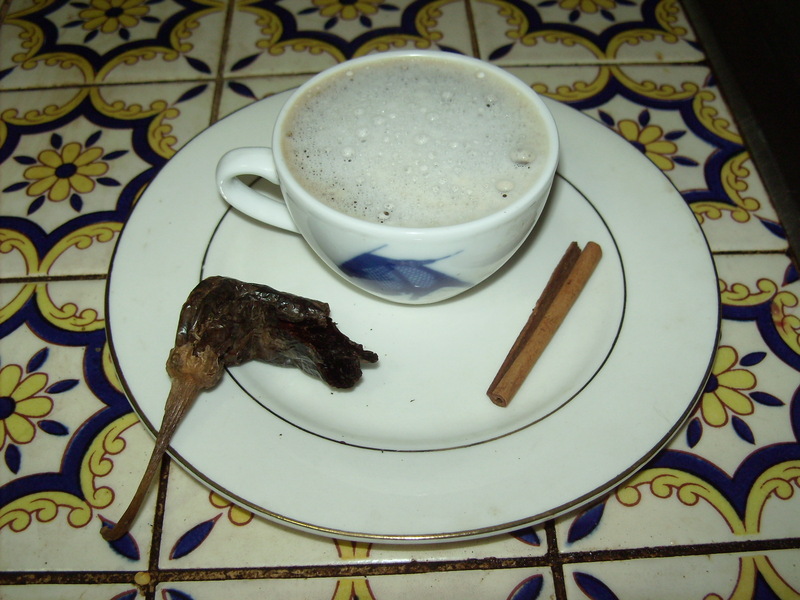 When I put my coffee beans in the next morning, my little chef magician voice said, “Ooh, this is fun, let’s add a cinnamon stick.” I did, and oh my god. It tasted like chocolate. Sure it’s weird. But not yick weird—it’s yum weird. Try it and let me know what you think. I’ve drunk nothing else the past three weeks. Pour some olive oil in the bottom of a pan (heavy bottom, if you have it) over a medium flame. 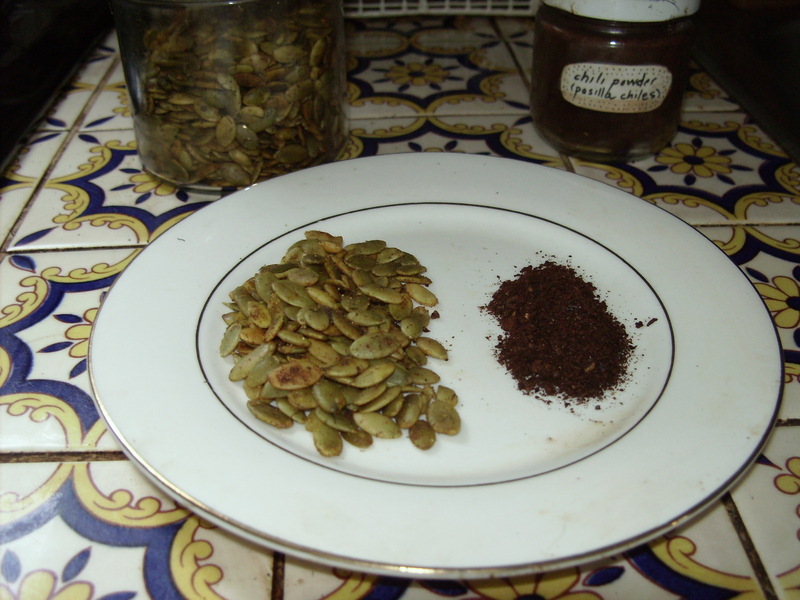 Let it heat up a little, then pour in some raw pepitas (pumpkin seeds), and stir to coat. You be the judge on the amounts, but it’s okay to have the pepitas a half-inch or so deep in the pan, and they should be a little oily, but not swimming. Now, go to your spice cabinet and do a little chef voodoo. What calls out to you? What’s your spice today? Gather a bunch of jars—for me, it’s usually 7 or 8. Here’s what I put in yesterday’s pepitas: cumin, coriander, pepper, chili, paprika, ground mustard, turmeric, salt, maybe a few more. They were yummy. I wasn’t in the mood for sweet, but I often add ginger, cardamom, cinnamon, anise, fennel, maybe curry, maybe even garam masala (which is a blend of spices itself). Just sprinkle and dump the spices on top of the pepitas; don’t worry about measuring. Stir them in so they are evenly distributed over the oil-coated seeds. When the seeds start turning different colors, taste them & see if they’re done. Be careful not to forget you’re cooking and let them burn! (I hate having to pick the burned ones out.) If they are not quite done, you can take them off the flame and they’ll keep cooking a little in the pan, but you won’t have to worry about burning them. Put them in clear jars on your shelf because they’re pretty that way. Use them on top of soups (especially Ann’s breakfast puree soups—cauliflower dill, zuccini-fennel, squash-ginger—upcoming in a future Mandala Chef blog! ), salads, in omelets, just for munching. I gave a little jar to my new NIA teacher for her birthday and she nearly swooned. This is easy to do (if you can find the chilis), and is so worth it, to have freshly ground, complex pungent chili powder. Buy a package of dried pasilla chilis—they come about 6-8 in a package here. These are easy to find here in Texas, but I don’t know about elsewhere. I assume that there are now starting to be groceries with Mexican specialties more widely available. Roast in the oven or toaster oven. Not long, a few minutes, until they puff up and are fragrant. Easy to leave in too long. Put in a little jar with a nice label, and use as you would chili powder. 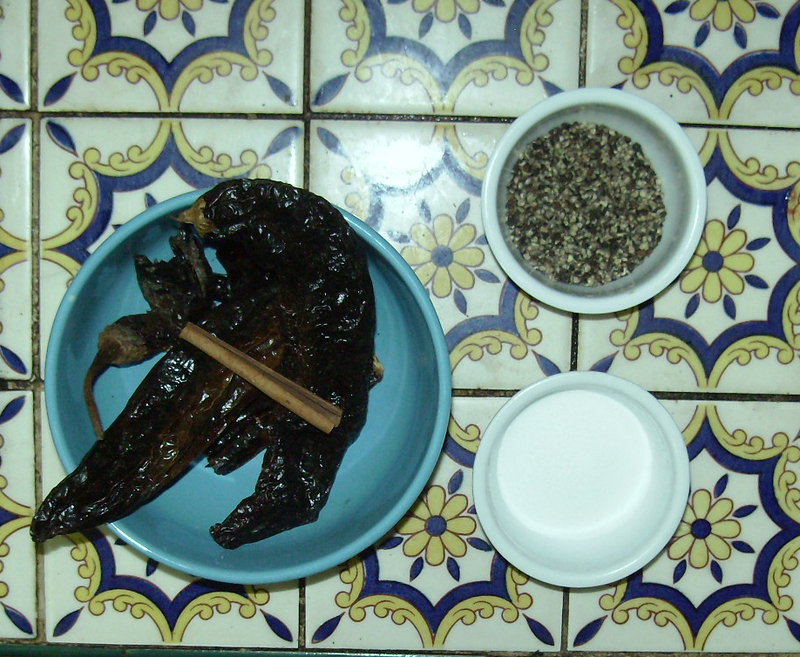 I keep a bowl of roasted pasilla chilis on my counter (see previous recipe). Tear up about one-third to one-half chili, put into your coffee grinder (compost the seeds), add half a cinnamon stick, and then the coffee beans. Voila! (Or if you don’t grind your beans, just add chili powder and ground cinnamon, it’s still great.) I drink it with soy creamer, and I swear it tastes like chocolate. I’m having a cup right now—it’s so good!